Located at 728 W. 20th in the Houston Heights, GeekLife is a local, woman-owned, business with inclusion at the heart of everything we do. We look forward to welcoming you! GeekLife sells a variety of games, books, comics and toys. We also host a variety of events for families and friends to rediscover & explore the magic of analog entertainment. Analog fun for the whole family. Family nights, ladies nights, tournaments and more! Bring the excitement home with the immersive power of reading! Wide selection of fun toys for all ages! 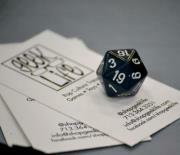 GeekLife sells a variety of games, books, comics and toys. We also host a variety of events for families and friends to rediscover & explore the magic of analog entertainment. Everything we do is geared toward our awesome community. Located at 728 W. 20th in the Houston Heights, GeekLife is your friendly, neighborhood one-stop-shop for everything you need to live the geek life.